Imagine your surprise—and sadness—if your Rolex was stolen. But imagine your even greater surprise if your stolen Rolex was auctioned by Christie's...for $92,000. That's what happened to Dave Siggins of Wichita, Kansas. In 2006, Siggins received an Oyster Perpetual, reference 14060M, from his employer, Big Dog Motorcycles, for ten years of service to the company. Just two weeks after putting on his watch for the first time, his house was burgled, and the Rolex, along with other jewelry, was stolen. Ten years later, Siggins' wife, Jenny, who had been looking for the watch ever since it was stolen, found that it had been sold by Christie's. Where Siggins' Rolex is now and whether he'll get it back or be compensated is the "to be continued" part of this story. Rolexes are, unfortunately, the most sought-after watch by thieves. Steal one, sell one. 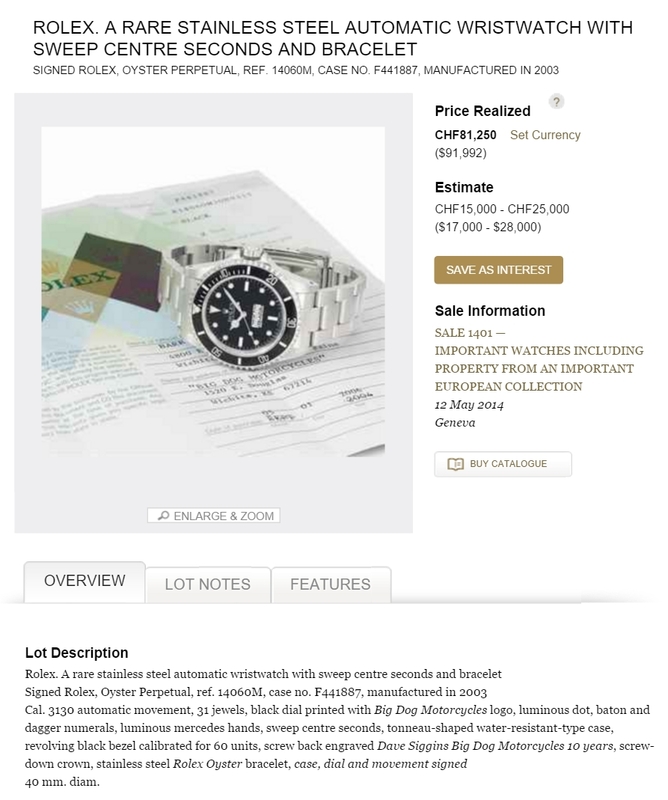 The Christie's auction catalog page for Dave Siggins' Rolex.